We are the project agency for the region Leipzig and Europe. 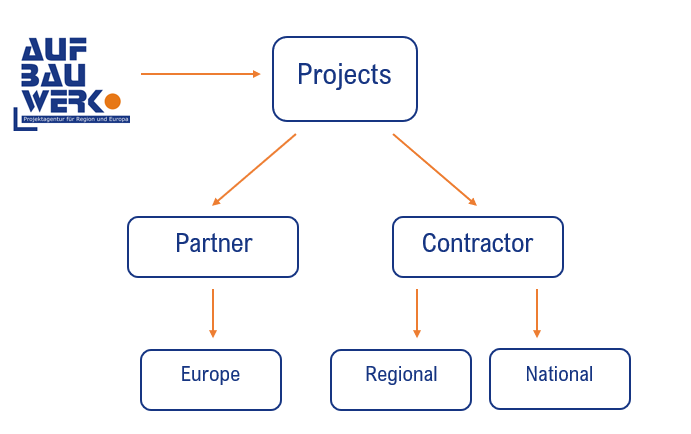 Whether as a partner in European projects or as a contractor for regional projects, we guarantee a successful closure of projects! We have a local and European network at our disposal. We advise and provide information. The Aufbauwerk Region Leipzig (°1994) is a joint municipal cooperation of the city of Leipzig and surrounding regional administrative districts. We have a long history of success in management of EU-projects and economic development measures. With an experience of 25 years and the help of European and national funding programs the central focus of the Aufbauwerk Region Leipzig is the strengthening of urban and regional development. As a project agency for the region Leipzig and Europe we support within the project development, monitoring and documentation. The City of Leipzig is with its 57% the majority shareholder of the Aufbauwerk GmbH. The administrative district Leipzig is with 23,5% shareholding the company. The administrative district Mittelsachsen is with 17,5% shareholding the company. The WFG-Wirtschaftsförderungsgesellschaft mbH – economic development society WFG – of the administration district North Saxony functions as a service point for companies, investors and initiators of regional, national and international projects with an economical relevance. The society is 100% subsidiary of the administration district North Saxony and is 2% shareholding in the Aufbauwerk Region Leipzig GmbH. The objective of the agency is to integrate the promotion of business and employment. A particular focus is on the bundling and integration of the promotion of business and employment. Not only the development of corresponding projects, but also the combination of different types of financing and resources are particularly significant.